Most people who carry a handgun, carry with a traditional hip holster. The most popular way to concealed carry is with an IWB holster, usually worn around the three o’clock to four o’clock position. However, there are situations where a regular holster may not work. 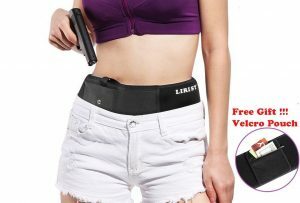 A belly band makes carrying a handgun easy. If you’re not familiar with belly bands, they are simply a big band of elastic, worn around your hips, and secured with velcro. If you are looking for a good belly band, you will want to check out the list of belly bands listed below. 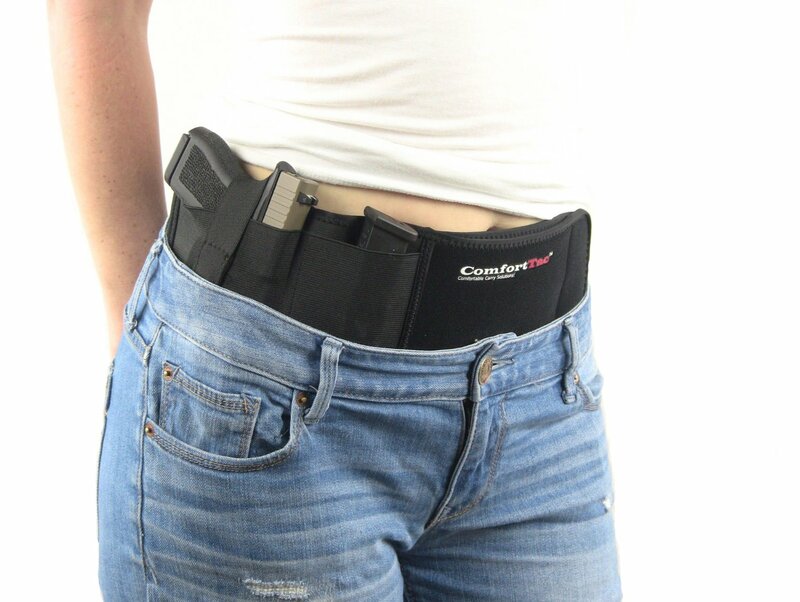 Our top pick in belly bands is the ComforTac Ultimate Belly Band Holster. This belly band is made of neoprene, which is much softer than elastic. Neoprene is the material knee braces are made of. Not only is neoprene softer, it is thicker and will hold the weight of the gun better. Why would you consider using a belly band as opposed to a more traditional holster? Some activities require a different type of holster. If you are a jogger, you won’t be wearing a belt as you jog and the small pockets in your sweats may not fit a pocket holster well. Same thing with going to the gym. Sweats and yoga pants are not the best wardrobe choices for a hip holster. Some people would rather use a belly band than any kind of off body carry, like a bag, briefcase or purse. They feel more secure having their gun on their body. Some people do not enjoy other holsters. They don’t think carrying on their hip, ankle, or shoulder is comfortable and they come to find belly bands comfortable. Belly bands usually have two or more pockets in them so you can use the extra pockets for extra ammo, or personal items. They are made from a stretchy material so you can carry different size handguns. Most guns, full size to subcompact, will fit in your belly band. You may end up only needing this one holster instead of having to buy a ton of different holsters. The biggest disadvantage of a belly band is how difficult it can be to get to your gun. Since it is deep concealment, you will need to take extra steps to get to your gun, such as lifting a tucked in shirt, etc. Since it is a big elastic band, the pockets will not stay open after you draw your gun. You will not be able to re-holster with one hand. This may or may not be an issue to you. Most belly bands do not wick away sweat. If you are using a belly band during exercise, or in the heat, and you sweat, you will need to wipe down your gun to avoid any rust. Deciding to carry a firearm concealed is a decision that most people come to for their protection, or the protection of their loved ones, or both. Whatever the reason, an increasing number of people are applying for concealed carry permits, across the country. Each state has it’s own set of rules for applying for a concealed carry permit. You will need to know the laws for your state. Most states fall within one of three types of jurisdictions. Most states are “shall issue” jurisdictions. This means permits to carry concealed shall be issued if certain requirements are met. “May issue” jurisdictions allow concealed carry but the issuing authority may or may not issue one. Not only do you have to met the requirements you may be asked to show good reason for needing to carry concealed. Self defense is usually not a good enough reason. While the only “no issue” jurisdiction is Washington, D.C., some states like Hawaii, Maryland, and New Jersey may as well be “no issue” because they almost never grant a permit to conceal. Regardless of what jurisdiction you live in there are certain steps to take to apply for your concealed carry permit. You can check your local laws here and here. Cornyn’s Concealed Carry Reciprocity Act of 2017 wants to allow legal gun owners to carry concealed firearms, “freely between states without worrying about conflicting state codes or onerous civil suits,” said Sen. John Cornyn, R-Texas, regarding a bill working its way to President Trump. “The current patchwork of state and local gun laws is confusing and can cause the most conscientious and law abiding gun owner to run afoul of the law when they are traveling or temporarily living away from home,” said Chris Cox, Executive Director of the NRA-ILA. There is an estimated 14.5 million permit holders in the United States. They want their permits to be valid across state lines. Trump, who has a concealed carry permit himself, seems to support this bill and others like it. It’s always best to stay abreast of current laws, in your own state, and any state you plan on visiting, with your firearm. This belly band is soft and strong. Made from neoprene, this holster is comfortable, and gives you the option of wearing different sized guns. This belly band is made from neoprene so it is soft against the skin, and strong enough to hold the weight of the gun. It is versatile, comfortable and conceals well. This is a comfortable and strong belly band, made from neoprene. It won’t pinch your skin or pull body hair. For comfort and great concealment, this holster works. You can wear this holster under any clothes. Office attire, skinny jeans, yoga pants, sweats and shorts are all examples of clothes you can wear a belly band under. This holster is comfortable and convenient. This holster holds your handgun securely and tightly against your body. You can’t tell you’re carrying, even with a tucked in shirt. As you can see, there are some good options for you. All these belly bands have their pros and cons, but the ComforTac Belly Band outshines the others. This holster is very comfortable. Made with neoprene, it won’t pinch or pull and is soft, for all day comfort. 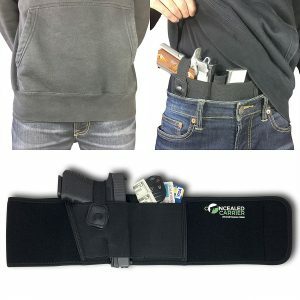 Belly bands are a great way to concealed carry your handgun. They do come with some measure of compromise though. Since they are deep cover, quick draw will be compromised. 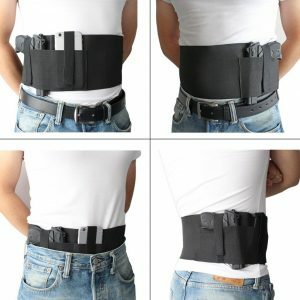 Some people feel belly bands are superior to off body carry. Draw will be quicker than looking through a bag for your gun and you will always have your firearm in your possession. I have tried IWB, pocket and belly holster so far, but my personal favorite is belly band holster. It’s very comfortable and more secure than other types of holsters. Moreover they have more than one pocket so you can add extra ammo. I am looking for a good belly holster for my Glock 19. Can you please recommend me a good one? If you read the article (or even the first couple paragraphs), we clearly recommend the ComforTac Ultimate Belly Band Holster. 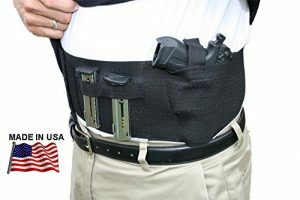 Thanks again for your comment, and good luck finding a belly band holster that comfortably fits inside your waistband. Been using the Defender belly-band for 8 years and find it to be the best one on the market it is also the original one. I find it weird you do not include it in a list with others that have outright copied the design.